Well unless you have a thing for calculators (a different user experience all together, so I’m told 😉 ), then calculators don’t float anyone’s boat, much less write about the User Experience of an online payment calculator. One of the first user interface devices on the WWW was the advent of payment calculators. But why did it take so long to find one with such a user friendly experience??? Take a look at the image below and see what I am referring to. 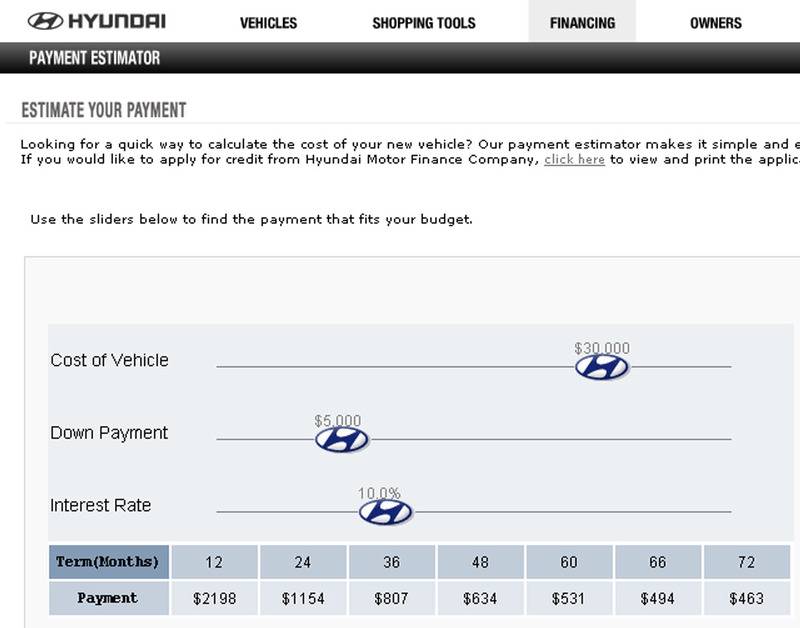 There are the 3 slider bars so you can see in real time what your payments will be for the vehicle, not having to refresh the page each time! No more of the old fashioned method of put in a variable, hit calculate, see what the difference is and then write down notes to yourself to view the payments. With this interface you adjust the variables in real time and the payments are reflected back to the user! What a great User Experience! As the end user I dont have to write down notes, compare, refresh, enter data, refresh, rinse & repeat. The user experiences instant results with the adjustments and can quickly move on to a purchase. So what? So what I’m in Human Resources…I’m in the tire kicking business…remember this: if you make the user experience friendly and where the information is readily available not only will the customer be more inclined to buy (and keep you in business) but your job became that much easier! A great example of a making a product with the end user in mind when they built the device! Good job!